The University at Buffalo Solar Strand, brought to life by world-renowned artist Walter Hood, reflects the transformative vision that defines UB’s long-range aspirations. Its approach moves beyond just obtaining carbon neutrality and lessening our environmental footprint. It also welcomes students, faculty, staff and community members to campus through a connected cultural and natural landscape. Like UB, the strand is multidimensional and cross-disciplinary, merging teaching, learning, art, research, sustainability and community engagement into a complex and powerful resource. Groups of photovoltaic panels are mounted onto supports that stretch in three rows along Flint Road, creating a new gateway to the North Campus. The design’s logic is derived from the “strand” concept: a linear landscape formation and DNA fingerprint. Walkways run between the rows of panels, connecting the array with local roads, the Center for Tomorrow, and naturally regenerated meadows and wetland areas that the public can enjoy. At 140 feet wide and 1,250 feet long, the array has a rated capacity to produce 750,000 watts of energy. The project, one of the largest ground-mounted solar arrays in New York State, was funded by the New York Power Authority. The initiative generates enough carbon-free energy to power approximately 700 student apartments. It also will create natural classrooms for pre-K through post-graduate students. 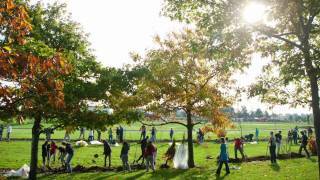 WSJ features Solar Strand in “Best Architecture of 2014"
The UB community came together to plant trees and fulfill the vision of Solar Strand Artist Walter Hood.